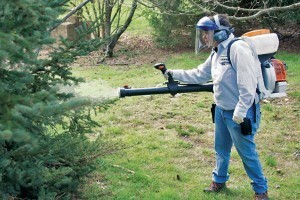 Pest management professionals (PMPs) offer advice on mosquito management methods that have worked for them. For 15 more mosquito management tips from the pros, check out Pest Management Professional‘s 2019 Mosquito Management Supplement. Inspection is a necessary first step prior to any pest management service. When servicing for mosquitoes, walking the treatment zone first will allow you to identify items in the area — such as children’s toys and pet dishes — that should be removed. It is also a good safety practice because it allows you to identify and possibly correct hazards such as holes, electric fencing, briars and so on. — Todd Barber, Owner, Barber’s Best Termite and Pest, Tallahassee, Fla.
Clear the treatment area of people and pets, and toys and pet bowls so you can treat the area properly. If people or pets are present, you are going to have to skip the areas directly around them, which is where the mosquitoes will want to be. — Brian Ranes, ACE, Operations Manager, McMahon Exterminating, Evansville, Ind. Conduct a thorough inspection to pinpoint any conducive conditions that may exist. An integrated pest management (IPM) checklist will give customers a sense of value and customization, plus homework for anything that needs to be altered that the PMP cannot do. This will create a “buy-in” from the customer to ensure satisfaction. — Kevin Hudson, Director of Sales and Business Development, Advanced Services Pest Control, Augusta, Ga.
Reducing and eliminating water sources is critical to successful mosquito management. Educate your customers on its importance. PMPs may visit the site on a routine basis, but they are not there all the time. If your client understands that source water reduction will have an impact on where mosquitoes lay their eggs, they will be more likely to eliminate standing water. Thoroughly explain what your service program is designed to accomplish. Customers must play a significant role in the mosquito management process for best results. Keeping an eye on their property and reducing source water, routinely mowing the lawn, and raking leaves or pine straw are few examples of how customers can help. When performing mosquito service, you are often at the mercy of the elements. You may have a full day of mosquito treatments scheduled and it rains all day or you may have completed a full day of mosquito services and it rains all day the following day. Timing is important when performing a mosquito service. With those variables in mind, think twice before offering a guarantee. —Todd Barber, Owner, Barber’s Best Termite and Pest, Tallahassee, Fla.
Do not treat if the area is wet, whether from a recent rain or dew. The product will be weakened and the treatment will not be as effective. We also won’t treat if rain is imminent. It is better for us and our customer to reschedule on a day the treatment will be more effective. — Andy Yant, President, PEST Inc., Goodlettsville, Tenn.
Let customers know up front this is a partnership and we will both have to do our part to make the service(s) successful. Also, tell them you will be there for them every step of the way. Sometimes pest issues aren’t just about applying pesticides; other conditions contribute and must be taken care of so the pesticide can do its job. Never guarantee 100 percent elimination of mosquitos. It just isn’t possible due to the weather and travel patterns of mosquitos. Instead, tell customers you offer a mosquito reduction service that will provide relief from their current problem. PMPs are in the business of mosquito suppression, not mosquito elimination. Anyone willing to offer a guarantee that they will eliminate mosquitoes from a customer’s property is setting themselves up for failure. Try to focus on a small trial-size area to see if you can show the customer the value of your service, and then let them decide how much more they want you to cover. Let your customers do their own up-sale. — Jerry Vance Sr., Owner, Discreet Pest Control, Mesa, Ariz. Well-trained and professional service technicians can educate customers, and as a result keep a long-lasting business relationship. Don’t contaminate non-target areas. Doing so wastes your materials and time. It also risks upsetting your customers. — Richard Clark, Special Assistant, Trad’s Pest Control, Jacksonville, Fla. The label is the law, and smart practice to boot. Always protect yourself with the label-mandated personal protective equipment (PPE), and be sure your techs do the same. — Andy Shrawder, Owner, Hershey Termite and Pest Control, Hershey, Pa. Ask customers to spread the word about your services around the neighborhood. Consider offering community discounts. Remember, you may earn a great social media review by saving a backyard birthday party that would have been a disaster. — Michael Burks, Owner, Ecopest Solutions, Cleveland, Tenn. Inspect first to evaluate the treatment site and the surrounding areas to determine if the customer would actually benefit from the mosquito control treatment. Some properties are affected by surrounding neighbors or offsite issues that are not available for treatment. These could be nearby homes with clogged gutters, standing water, and heavy brush or foliage. In some cases, a mosquito control treatment would be a waste of money to the customer, so give them the choice based on your evaluation. Because customer satisfaction is very high on our list of priorities, they should be informed correctly so their expectations are met. — David Fleming, Owner, Pest Management Solutions, Spartanburg, S.C.